This blog is celebrating its first year with over 1,200 followers! I am of course in a happy mood as I mark this milestone. I believe that in the game of life, we achieve milestones with the help of others. In my case, I am well aware that WordPress.com was a big help in inviting followers. I remember when the blog was new, after each post, I would get a message from WordPress.com saying they had alerted a certain number of bloggers about my blog post. That went on for a while – a much needed boost. Then it stopped, and I knew that it was up to me to keep the ball rolling. Joining blogathons helped a lot too. I joined the Wordcount Blogathon, Yeah Write’s 31dbb, and NaBloPoMo. I know that these blogging events helped spread the word about my blog, and I encourage you to join one if you haven’t yet. Writing the posts for this blog was very therapeutic for me. I set it up initially with the intent of learning about creative writing, after a long hiatus from journalism. I knew I needed to catch up, learn anew. During the decade-long hiatus from writing feature articles, I tried content writing for a couple of years. That was a compromise, because I missed writing but did not have enough time to do the leg work needed to write good feature articles. Content writing provided me with the opportunity to work with words during my free time. But somehow, somewhere I lost the ability to express my own thoughts and feelings in public writing. I suppose this was brought about by the long, dry spell from journalistic writing, and the nuances of content writing, which makes one highly dependent on facts. Through this blog, I was able to recover my voice and write more freely again. It made me feel like a feature writer again. Ellen Gilchrist said, “The first thing a writer must do is love the reader and wish the reader well…Only such well wishing and trust, only when he (she) feels he (she) is writing a letter to a good friend, only then will the magic happen.” When I worked as a feature writer, the reader was always part of the bigger picture. Each story had to be written with the reader in mind. In the ultimate analysis, writing becomes a dance only when the reader joins the writer in her/his creation. Without the reader, the writer’s life would be very lonely indeed. I’ll work on listing the names and drawing the lots and then announce the winner this week. Congratulations ~ that is a huge achievement to keep blogging for a year and encouraging all of us writers so much. Aloha !! Salamat (thank you!) Renata! Looking forward to your new blog! Almost there Rosanna ~ almost ! Thank you! 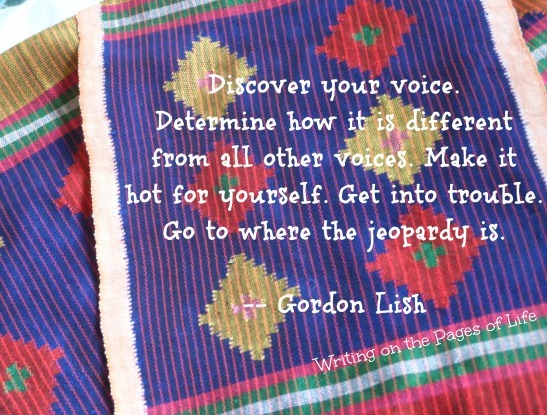 Yes, indeed, blogging is a big help in finding our voice. Bravo on your blog growth! I love the quote and given my penchant for getting into trouble and going where the jeopardy is, I oughta have a very naughty voice. Methinks, I need to let the inner-editor go first. Here’s wishing you’ll be able to fire your inner editor…and soon! Congratulations!! You are a star! Love the quote too.